Dystopian society, warring factions, and an unapologetic female assassin who isn’t graphically sexualized but drawn in a realistic fashion for her setting. All three of these factors contribute to what looks to be a unique book in the Dark Horse house. It’s hard to talk about this book without spoiling some of the gifts and surprises hidden throughout the story. What can be told is that it is set in a fictional island that has been ripped apart by a civil war between a steam punk like society and a more technologically savvy, but brutally based group. Amala is caught in the cross hairs living in the former and carrying out assassinations for the latter. Steve Horton writes moments of whimsy, danger and family all in one book. He is also extremely unapologetic for the fact that Amala is an assassin. Unlike other scoundrels or rogues that claim to be hard in the story, but have a crisis of conscience at the moment a life should be taken, Amala shows she has none of those issues. In fact, her brutal nature might create a disconnect for some readers who cannot marry the idea of this more all ages style of art with such serious subject matter and tone of voice. However, for those who frequently watch Adult Swim or Furturama, there will be no problem going with it. The art style of this book has a similar feel of books such as Princeless. Michael Dialynas does a great job of drawing Amala as the athletic female hero instead of sexed-up, minimally covered or protected superhero. This is balanced by Horton’s story and the love interest written into the story, which will undoubtedly lead to conflicts in later issues. The mystery surrounding Amala doesn’t lie in her work as an assassin or where her loyalties lie (she makes it clear, she has none except to her self-made family.) Instead, the mysterious element is the ghosts that appear throughout the book at Amala’s side: a monkey, a pirate, the character are very distinct. Why they haunt her has still yet to be revealed. 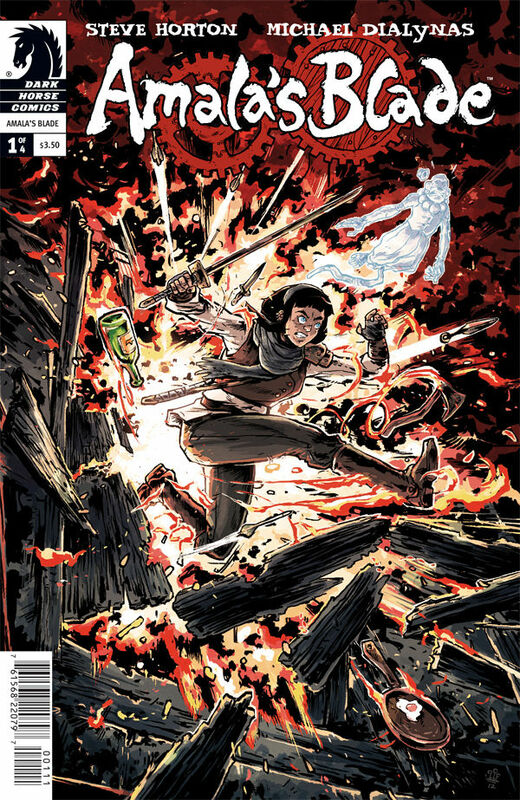 While this Dark Horse book requires no prerequisite reading, there was a zero issue out this last February that also introduced Amala and her life and is currently still in stock. 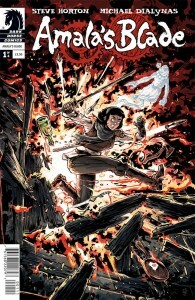 If you are looking for a powerful female character who’s opinions are no compromised for the sake of “broader appeal” then Amala’s Blade is exactly the title to cut through the excess that abounds.